After trying the Vichy Idealia BB Cream and falling in love with, I couldn't wait to give the new Idealia Life Serum a go. It is designed for skin exposed to stress, sun, pollution and an unbalanced diet to help transform the appearance of skins quality, tighten pores, add radiance and even out skin tone. I don't necessarily need a lot of help with my skin, because I eat a balanced diet, don't smoke or drink alcohol, but... after reading rave reviews, I thought that my skin might benefit from the Idealia Life Serum. First of all, the pink packaging is really nice and like most serums, it comes with a pump. It is suitable for all skin types (including sensitive), but those who don't like scented products might give it a miss. The scent is fresh and pleasant though and I really like it. 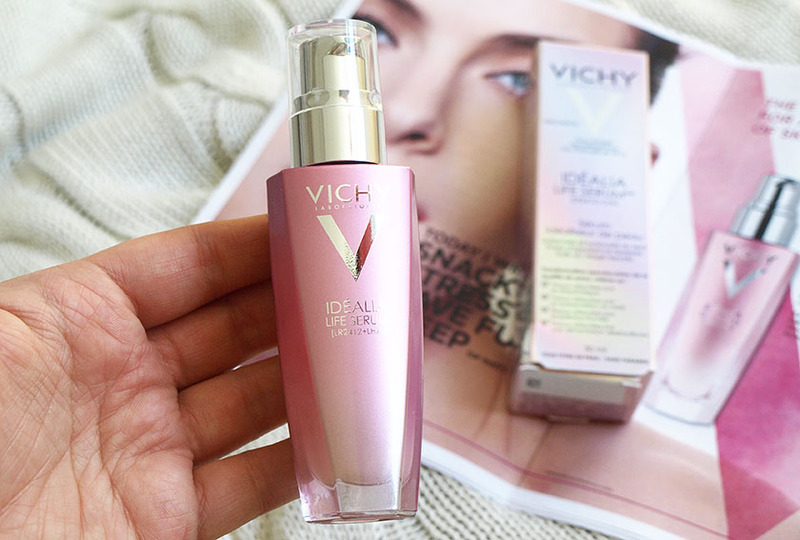 The consistency of Vichy Idealia Life Serum is light and silky, sinks into the skin quickly and leaves my face feeling soft and hydrated. 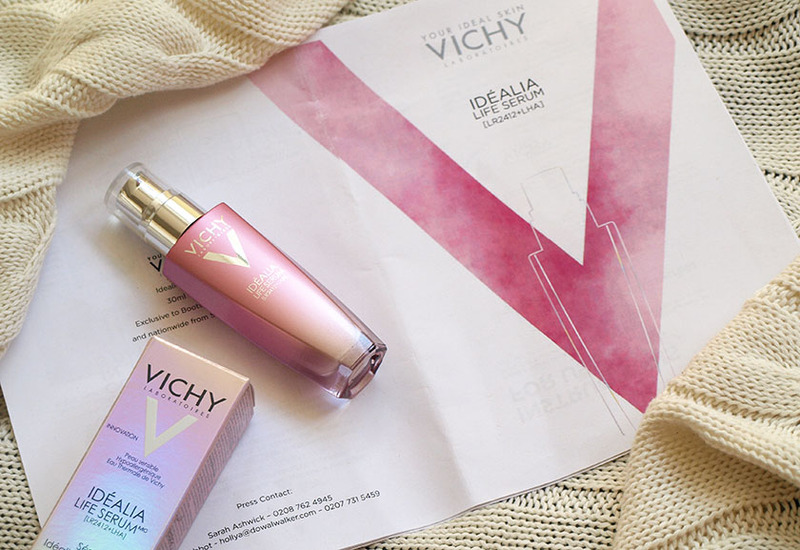 Unlike standard serums, Vichy Idealia is slightly "tinted" with a golden/pink sheen and it looks amazing on the skin immediately after application. If I had no scars and imperfections, I would wear it on it's own and wouldn't even think about applying foundation. It looks beautiful! The formula features a unique combination of ingredients, with 27 patents and skin correcting molecules and claims to transform the skin in just 8 days. I must admit- I am very impressed with the results so far. I have been using the serum morning and night for 8 days+ and it is amazing and does exactly what it says on the bottle. I always give skincare products much longer, before reviewing them, but I wanted to see if the 8 day period works. For reference, I have normal/combination skin and the serum seems to be helping to balance the oil and keeps dry areas hydrated. Perfect! 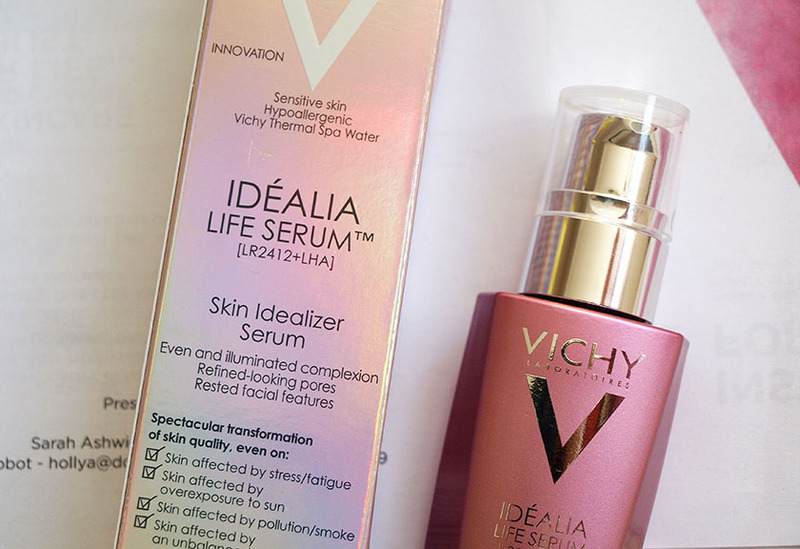 My biggest skin concern at the moment is lack of radiance and the Vichy Idealia Life Serum is exactly what I need to deal with this problem. It works really well under makeup, feels hydrating and soothing and adds a gorgeous glow to my face. It also helps to reduce the size of pores and makes my skin feel firm and supple. I will definitely repurchase it in the future. I am currently using it with the Vichy Idealia BB Cream and I am very pleased with the appearance of my skin and I can't wait to see long term benefits of using the serum.